As police clash with opposition protesters defying a government ban on demonstrations, Kenya's opposition candidate Raila Odinga tells DW his reasons for withdrawing from newly-scheduled elections. In an exclusive interview with DW, Raila Odinga, the presidential candidate for the National Super Alliance Coalition (NASA), talks about his decision not to stand in Kenya's rerun election scheduled for October 26 and why he believes these these new elections are also invalid. DW: Why did you decide to withdraw from the election this week? 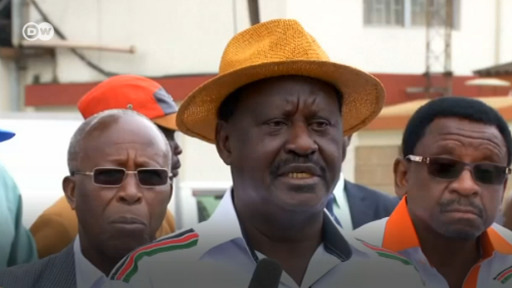 Raila Odinga: I had no choice but to withdraw because the electoral commission and the government colluded not to implement what they were ordered to do by the Supreme Court, in order to have a free and fair election. The Supreme Court had identified irregularities and illegalities which forced them to nullify the elections. They ordered that the electoral commission should do the elections in accordance with the constitution and the laws of the land. Unfortunately, they did not do this and that is what forced us to reluctantly withdraw from the race. There is a lot of confusion around this rerun on October the 26th. Do you think that your withdrawal in any way added to the confusion? No. My withdrawal did not add to any confusion. Actually the law is very clear. In accordance with the Supreme Court ruling of 2013; if one of the candidates, that is the president-elect or the challenger who was the petitioner, withdraws from the race, then there will be no elections. The electoral commission is then required to start to do a fresh nomination exercise and then a subsequent election. So there is really no election on the 26th in accordance with the law as we stand right now. What they are trying to do is basically purporting to do an election, but it cannot happen. They need to do fresh nominations. The High Court ruling in the case of Mr. Ekuru Akuot [where they ordered the electoral commission to allow Aukot to run as a presidential candidate in the repeat election] is a nullity because the High Court cannot overturn a ruling of a Supreme Court. Therefore there’s going to be no election on the 26th of this month. The IEBC [Independent Electoral and Boundaries Commission] says that you haven’t formally withdrawn yet. Will you be formally withdrawing? I don’t know what they mean by formally withdrawing because I have written a letter, which they’ve acknowledged receipt, in which I am telling them that I have withdrawn from the poll. So they are basically just playing a game of ping pong but they know it clearly that I have withdrawn because I have served them with a letter and they have received that letter. You have said all along that you have been fighting for free, fair and credible elections. Do you think that there is an institutional problem in Kenya which stops free, fair and credible elections going ahead? I don’t think there’s an institutional problem. I think it is more of governmental interference, a government which is interfering with free and fair elections, because they want to manipulate the outcome of the electoral process. So you find like the IEBC right now is hostage to the government. They cannot act independently. They have been infiltrated and penetrated by the government. About four commissioners are now agents of the government. Then there are several individuals, officials within the IEBC who are basically acting for the government. So until the government desists from this interference and allows the independent commission to be truly independent, we’ll keep on having problems. The other institution that is involved in electoral manipulation is the National Intelligence Service. It is involved right from the beginning: from the recruitment of the electoral officials, presiding officers, returning officers and so on. You find that some of them are government officials. In that kind of situation, you have a situation where you don’t have a truly independent electoral commission. And therein lies the problem. Do you think you have lost any political momentum in pulling out now and hopefully restarting the election from the beginning? Not at all, I think the people of Kenya are very disappointed and they’re very angry at what is happening right now. They have been saying that we have not been campaigning, whereas [the ruling Jubilee Party of Uhuru Kenyatta] has been all over the country rallying around, buying defectors and so on. We don’t need to campaign. The people know that these failures being bought by Jubilee are adding no value to the other side. In other words, they are not translating into votes, far from it. The people are actually waiting to cast their vote. We have found ourselves preaching to the converted. Our campaign is complete and our agenda is told to the people. So we have not lost any momentum. We are sure that if they level the playing field and we go back to the field, our majority will even increase over what it was on August 8 [when the original election took place]. We have nothing to regret. We think that this has been useful, the country is charged. And when the elections are called, we are definitely sure that we will win by a much bigger majority than we did last time. If anybody has doubt, ask them to ask the IEBC and Jubilee to agree to open the server of the elections of August eighth and to show how people voted. And you’ll see that we had a resounding victory, and we are convinced that next time round, our victory will be even bigger. This interview was conducted by Emma Wallis.